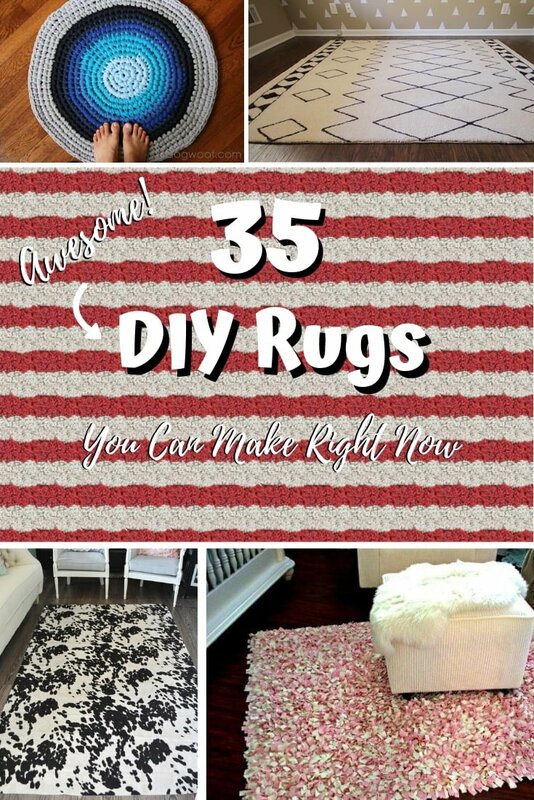 Here are 35 very easy DIY rug ideas with tutorials for you to start making your rug right now. The majority of them don’t even require sewing. A beautiful rug can transform the space entirely, but as it is a versatile decor piece, it can be just as expensive. That is unless you make a DIY rug yourself from inexpensive materials. 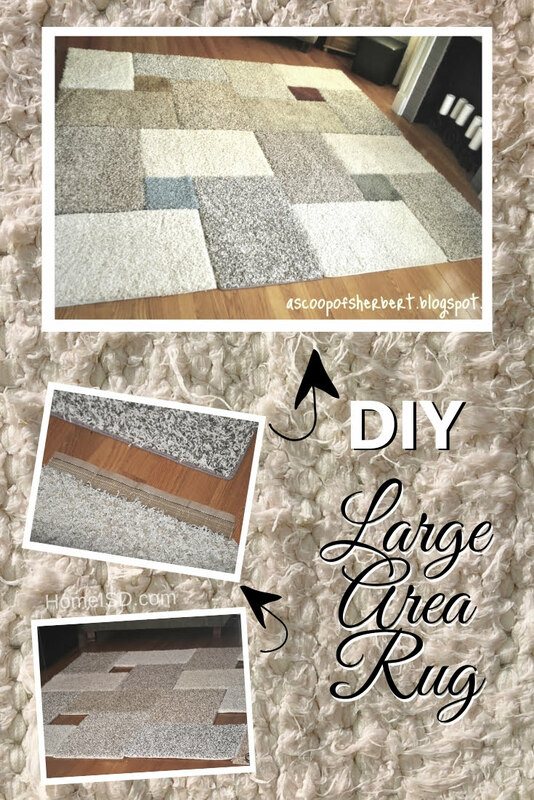 We love home projects and advocate making things for your home yourself, not only to save money but enrich it with creativity to, so today’s article is all about making your awesome rug. We have 35 straightforward DIY rug design ideas for you to start making your rug even if you haven’t done anything like it before. The majority of them don’t even require sewing. 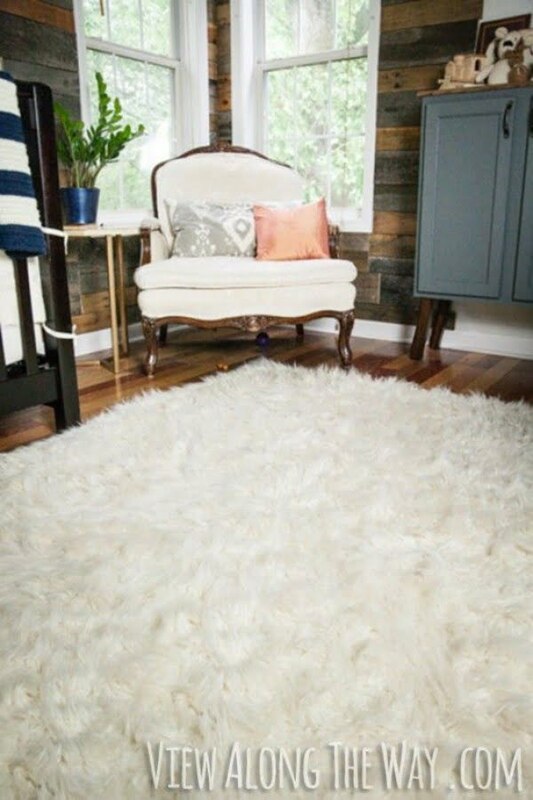 Make this shag rug from scrap fabric. Though it will take you a few days to finish it, it is a straightforward process that doesn’t even require sewing. 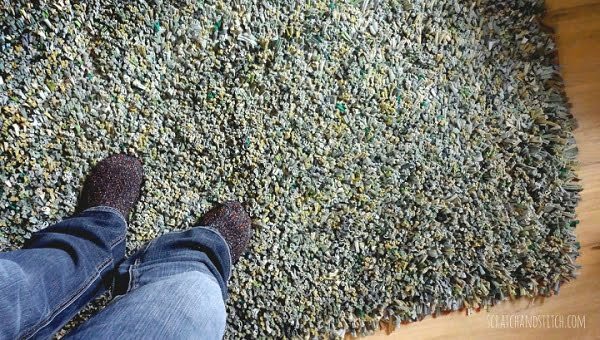 If you have some old jeans that you haven’t thrown away yet, you can make this beautiful rug from the denim fabric. 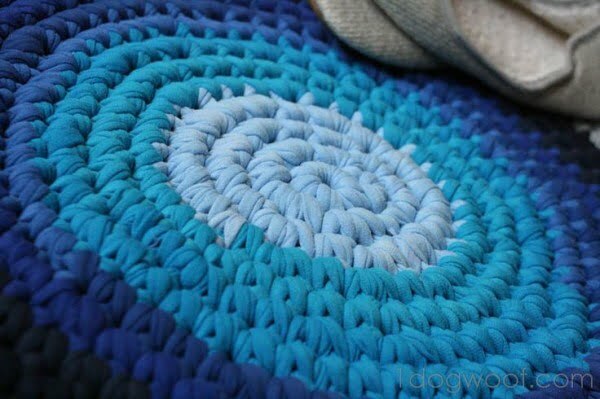 Old t-shirts always stack up, and you can put them to good use by making this awesome crochet rug from the fabric. 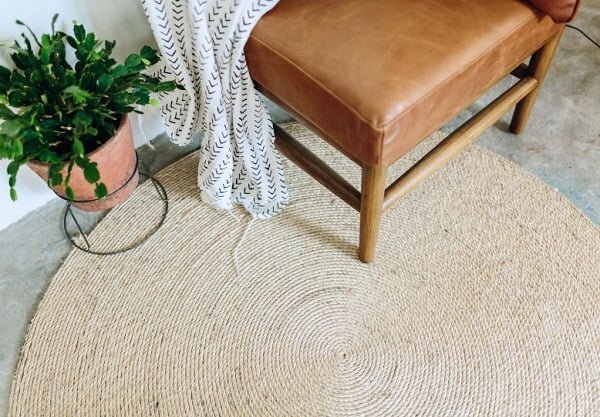 You can make this beautiful braided rug from just about any fabric you can find. 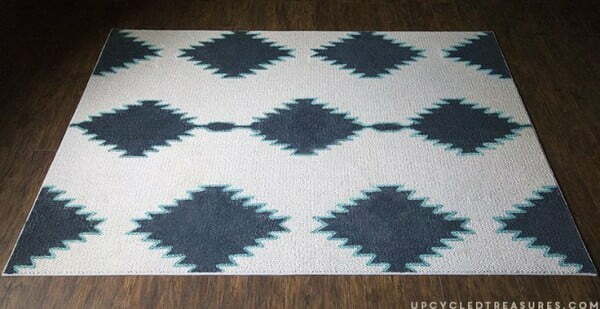 The pattern Kilim rugs make lovely accents, and you can make one yourself too. Here’s how. 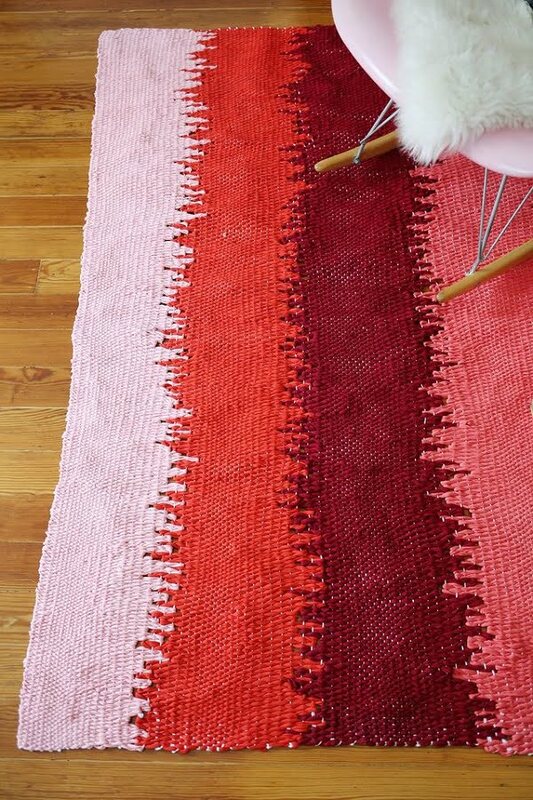 If you’re one for inexpensive knock-offs for a penny on the dollar, follow this tutorial to make yourself one inspired by West Elm pattern rugs. 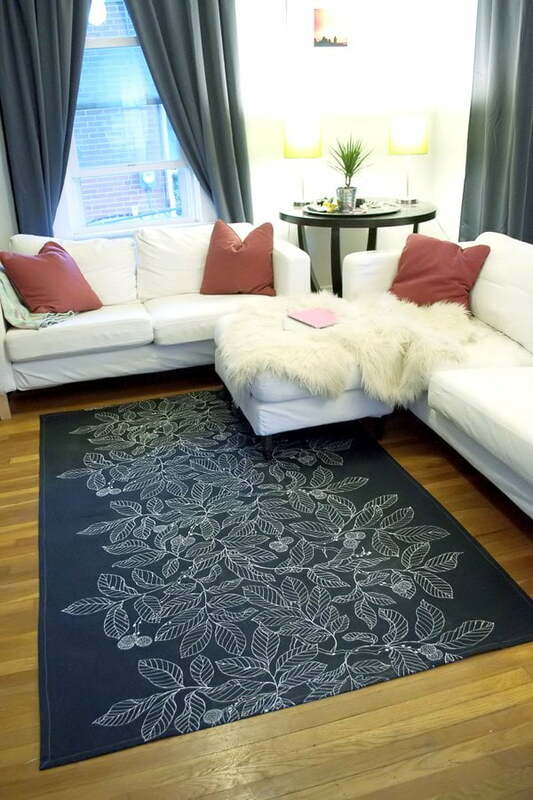 A rug like this can anchor your living room perfectly positioned against a sofa or under a coffee table. Let’s get creative with this tutorial for a cut out rug in any shape you like. 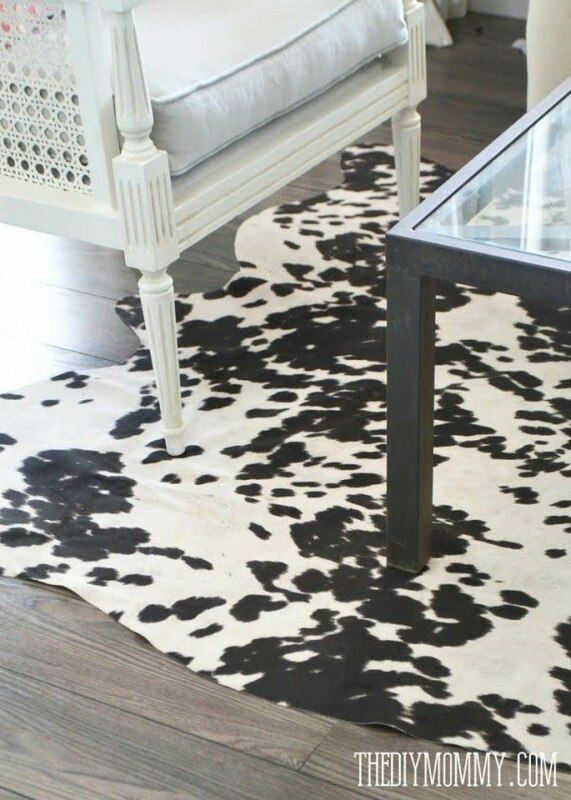 Cowhide rugs add a pleasing pattern as a decor piece, and you don’t have to spend a fortune on one. 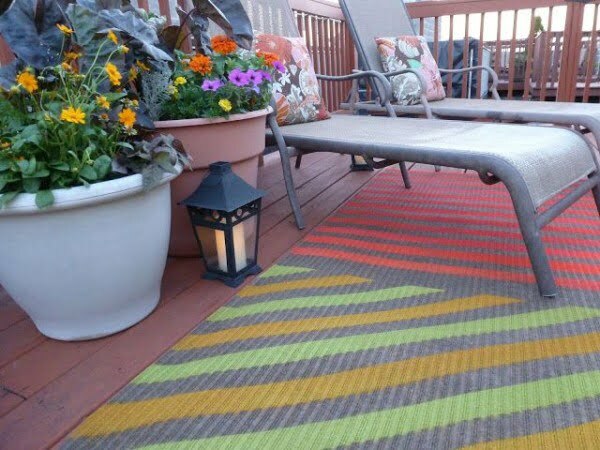 Don’t forget your patio and make a beautiful rug for the outside as well. Check out other outdoor project ideas you can do as well. 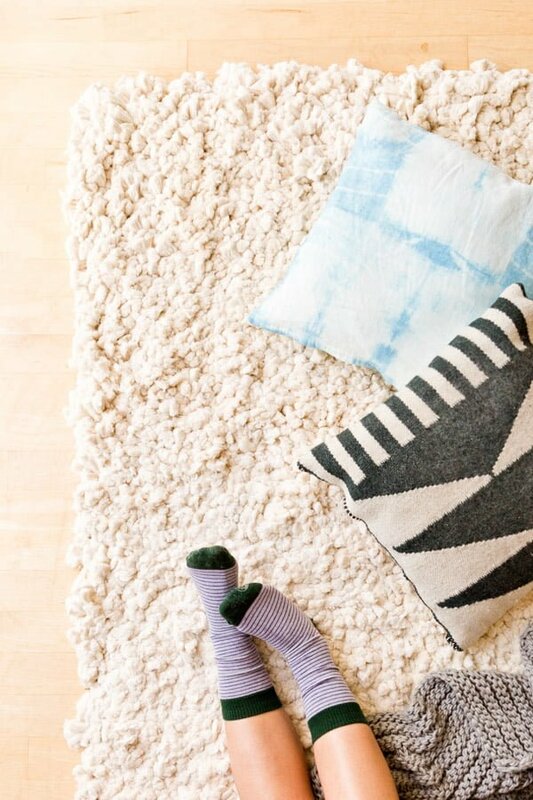 It’s soft and fluffy – just the kind of rug you might need to warm up your decor. You can make one quite easily from yarn. 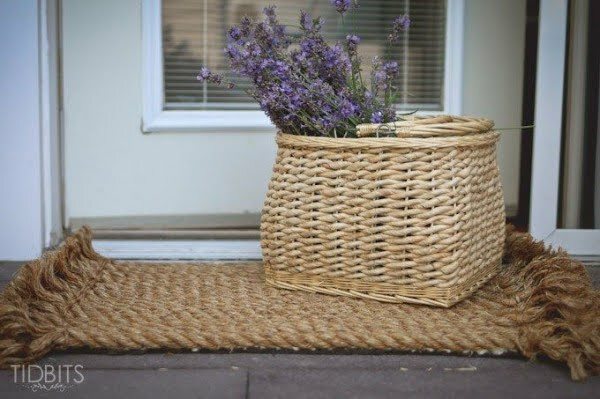 Use some rope to make this beautiful rug for the outside entryway or inside. It will make a brilliant accent by adding a new texture to your decor. 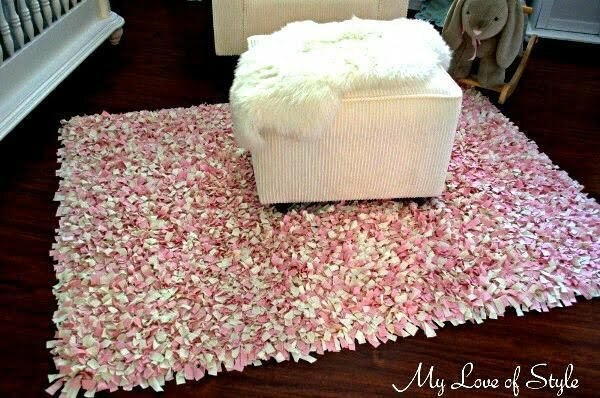 As expensive as it looks, you can make a faux fur rug quite easily yourself from much cheaper materials. Tablecloth fabric usually comes in beautiful patterns that you may want to use for a rug. You absolutely can do it. This beautifully patterned, elegant looking large area rug is prepared altogether with square carpet rugs, and the expenses didn’t go beyond a paltry $30! Quite incredible, right? Check out the tutorial to find how you can DIY this one and do pay particular attention to the carpet glue mentioned there. 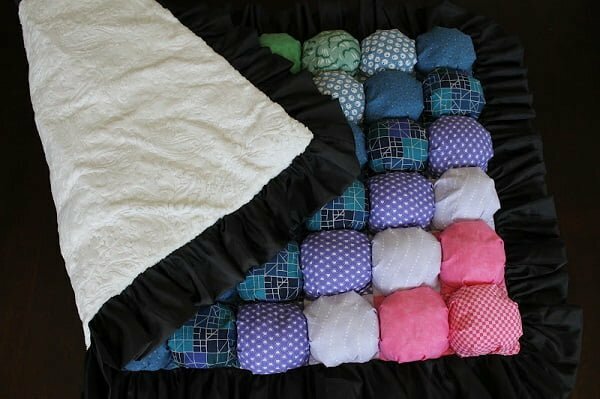 Ideal for your kids’ room, this appealingly fluffy square rug was made with nothing more than scrap fabrics and a non-skid rug mat. You don’t even need to tie the fabrics into the rug mat holes. It will take you some time to finish the job, but you’ll be happy with the reward! 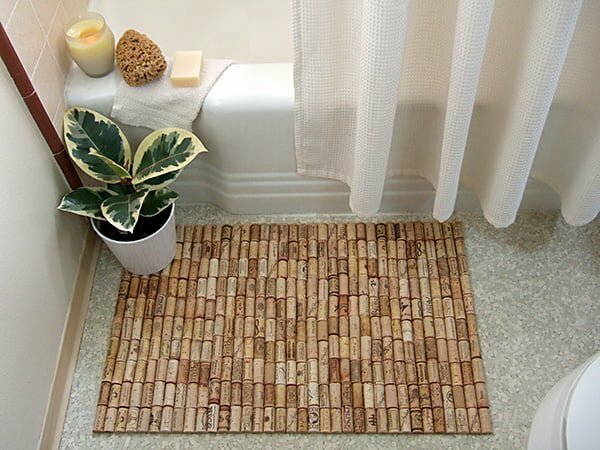 This DIY bath mat closely resembles the look of a bamboo mat and is ideal for placing in your bathroom. The corks give a nice feel to your bare feet, and the organic material will also do a fantastic job of soaking up the dampness. Check out this innovative DIY idea in this detailed image tutorial. For a mat, this one is our favorite! It will require some time and patience on your part to get the hang of how to form the loops around (closely follow the images given on the tutorial to make sure you are getting them right), but once you master that, the rest is a cinch. 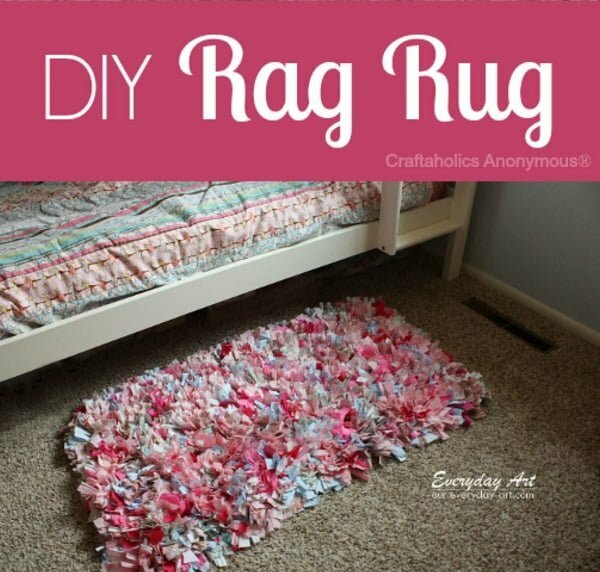 Another scrap fabric DIY rug your kids will love. Follow the instructions carefully to make sure that you get them puffs/biscuits/bubbles stitched right. Play around with fabric colors and patterns to match the décor of the room. This one looks both flunky and elegant for your bathroom. 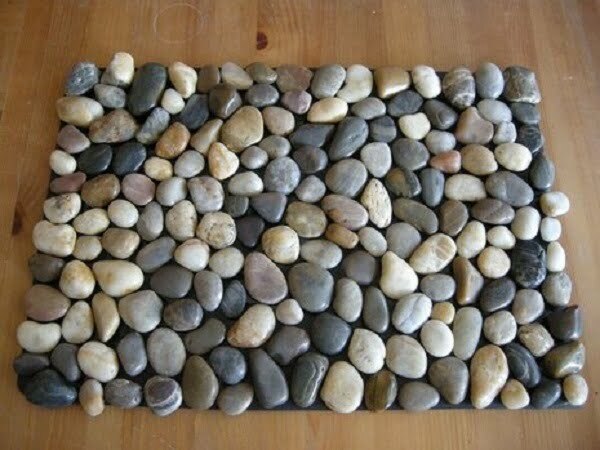 And all you need is a rubber welcome mat, some hot glue and a bag of pebbles, of course. You can either go monochrome with the pebbles or choose stones of different colors, patterns, and shapes. Quite apart from the awesome look of the finished product, you’ll love working on this tapestry project. If you are new to tapestry, the skills you learn doing this project will stand you in good stead for many other craft projects in the future and will also act as a source for many inspiring ideas. 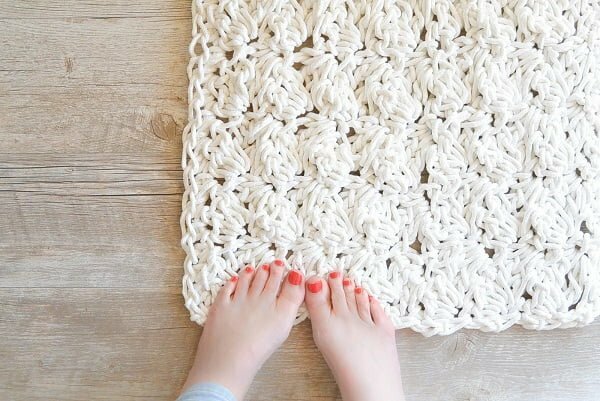 This rope rug is made with single and double crochet stitches using ropes (clothesline) made with soft fabric. 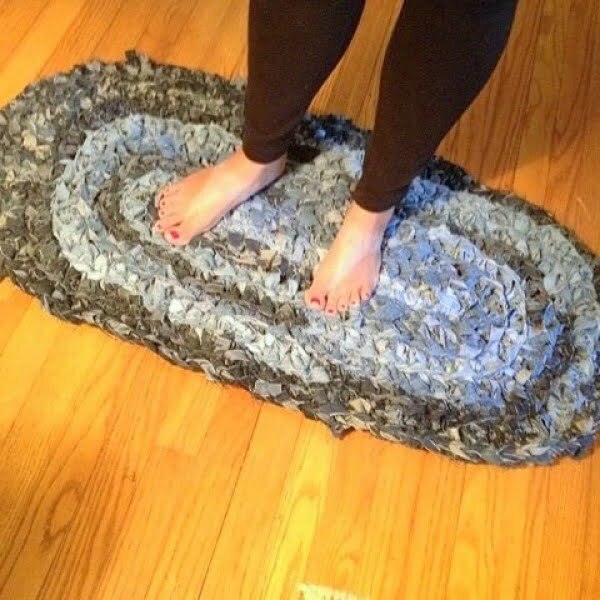 The one on the tutorial is created as a bathroom rug, but you can play around with the idea and can come up with some innovations of your own as well. This one will be ideal for your living room and is quite easy to make. You use a tarpaulin base and a nail glue to secure the rope on the base as you go spiraling the rope from the center outwards. The good part of it is that you can make it as large or small as you want, depending on your current requirements. Want a large area rug that feels super soft, fluffy and comfortable? 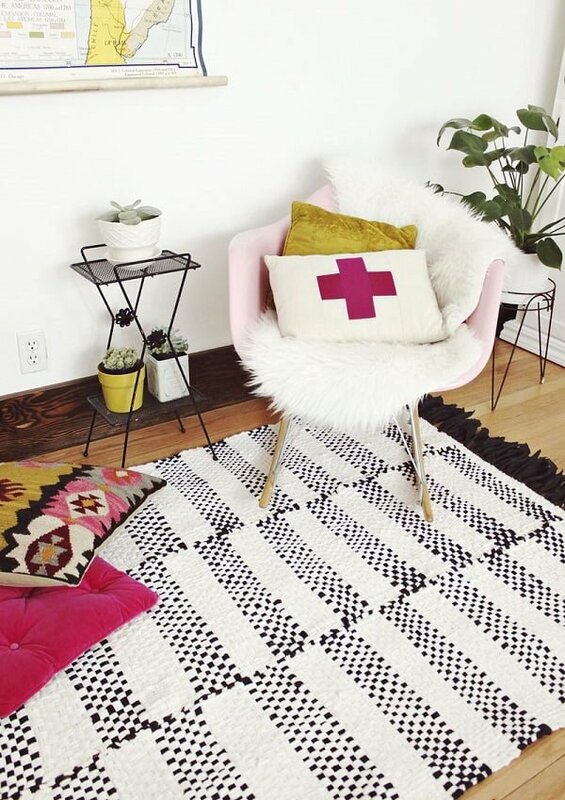 Then check out this wonderful DIY tutorial to find how you can make this elegant and comfortable large-scale rug all on your own. 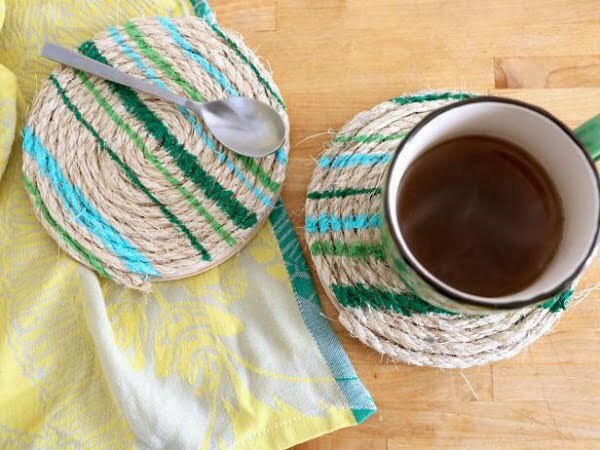 These painted rope trivets follow much the same method as in the previously mentioned coiled rug project, the only difference being that they are trivets instead of a rug. Which means they are way smaller and they also use wooden plaques as the base material. Try this project to add some more colors to your kitchen. This one is our favorite when it comes to coiled rope mats. 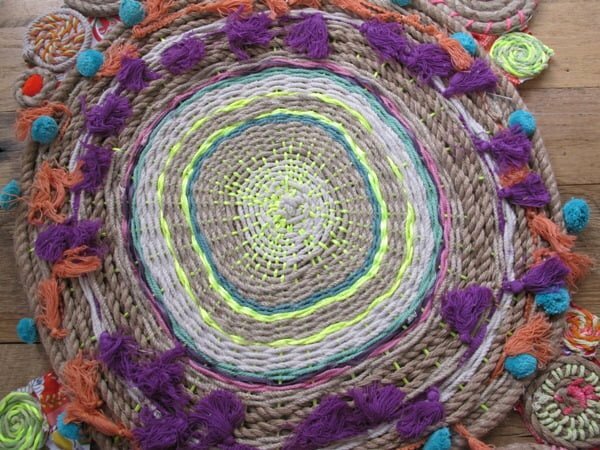 The idea to stitch up different sized circles to create an abstract doormat is simply a stroke of brilliance. 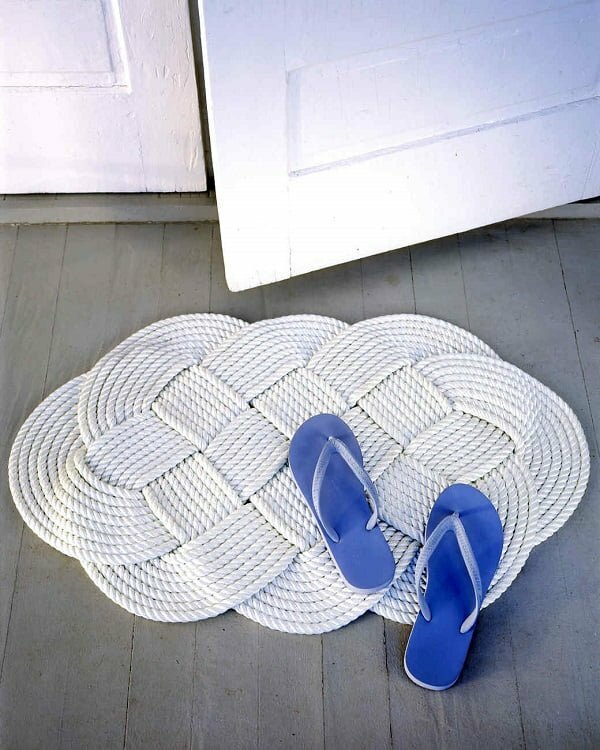 We also love the idea of lightly spray painting the ropes since this helps to add a nice and cool accent to the mat. This one gives you an opportunity to add some exciting prints on your large area living room rug/mat/floor cloth. 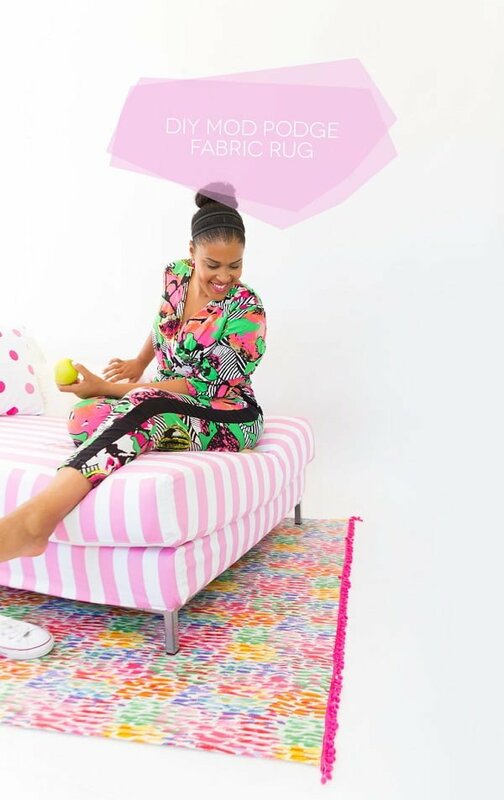 As the blogger makes clear it is more of a floor cloth than a rug, but it is plush and comfortable enough, and you will love that printed fabric on the floor. With all the work involved (cutting the t-shirts into thousands of thin strips, dying them and finally latch-hooking them onto the canvas rug mesh), the project is a time consuming one. But the resulting product looks incredible. So, if you do have some time to spare, go for this one. Again, you need time, patience and some skill to carry out this project. But once you learn the trick, you can use these rope tapestries to make mats, rugs, wall decorations and many more. 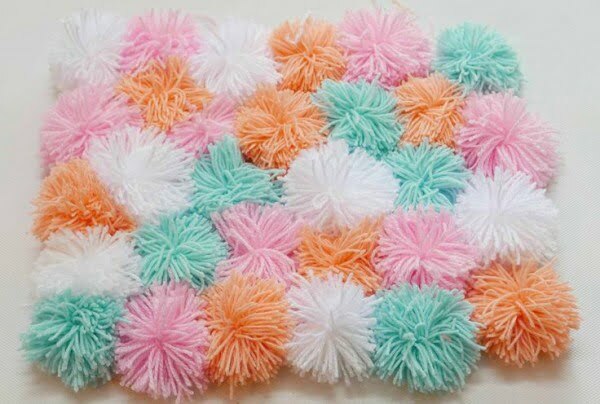 This felt stone rug looks nice and is fluffy and comfortable. 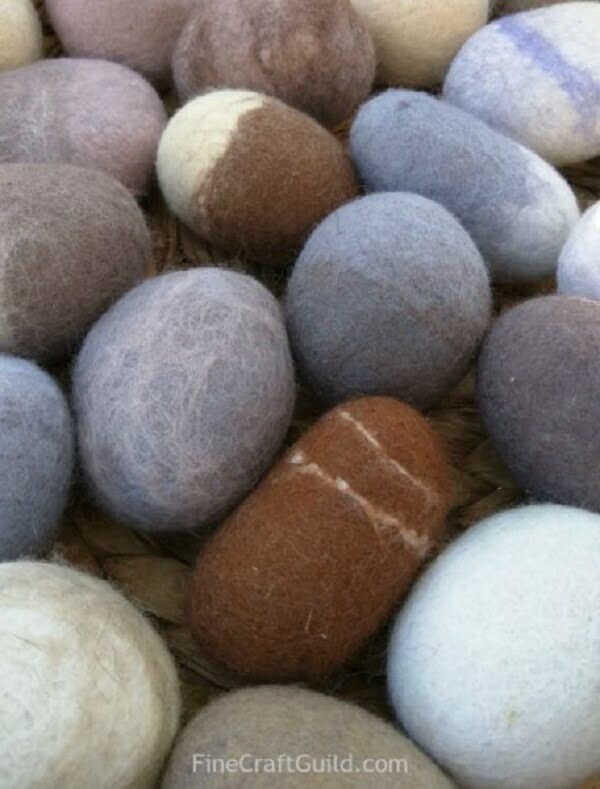 The tricky part is to make those felt stones. 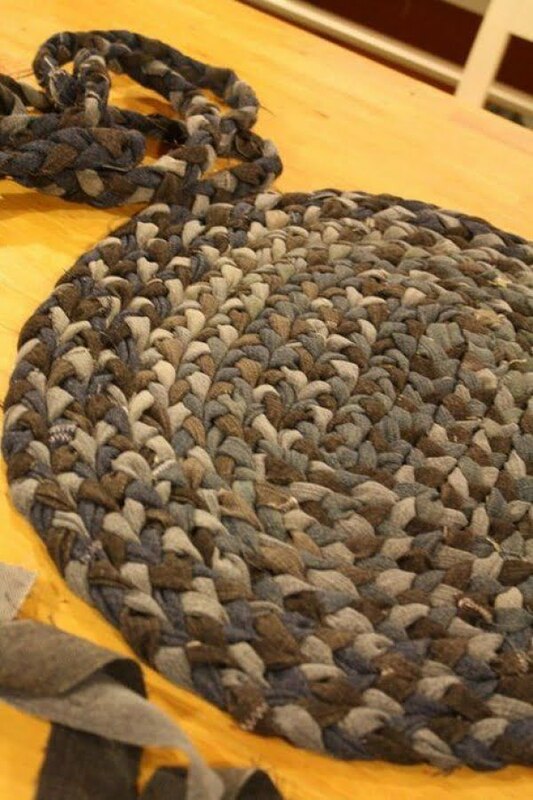 Once you are done with that, it is a cinch to attach the rocks to the latch hook canvas rug backing. Some more weaving and tapestry. Which means time and patience on your part. But have a look at the finished product, and you may find it hard to not jump in on this epic project! We like this one for the simplicity of it. 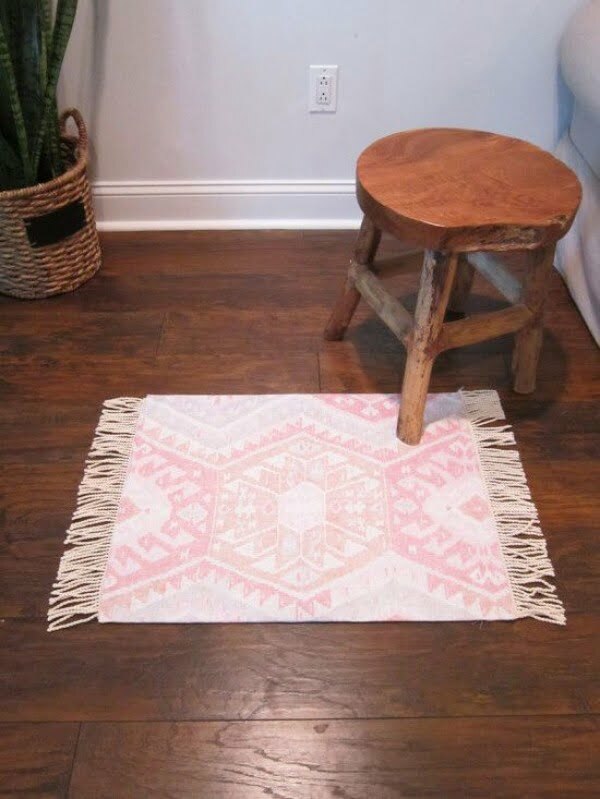 You use a large piece of drop cloth and fabric of your choice and use mod podge to glue them together and then attach the article on to the canvas rug base, and voila, you’re all done! 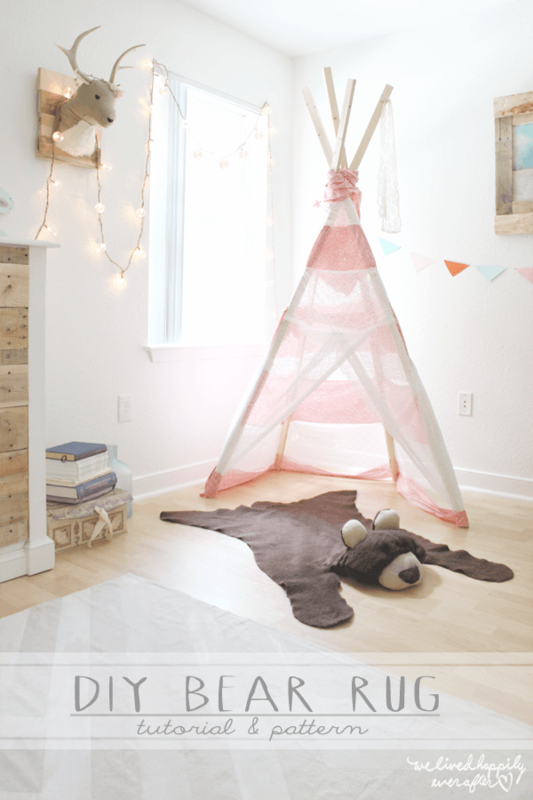 Another rug that kids will be crazy about, but you can as well place it on your living room. This one, too, is a cloth-based project. Check this great tutorial to find more. 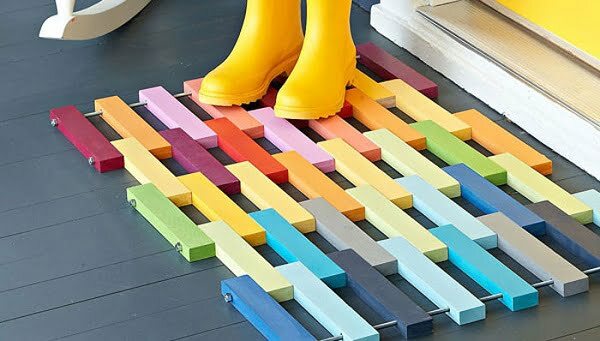 This one is a new age, and we love the bright colors used for this pine wood floor mat. The project is easy to follow, and even beginner DIY-ers can finish this without much ado. 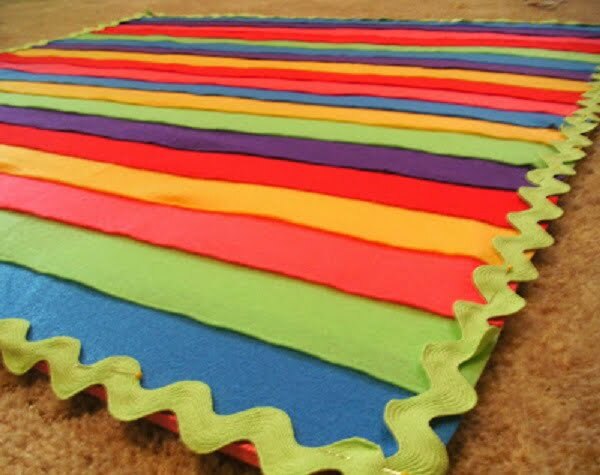 This technicolor rug made with different colored felts ideal for the kids’ room. You don’t need any expensive supplies, and the most significant plus is that thanks to its lightweight, you can lug it along outdoors whenever you want. 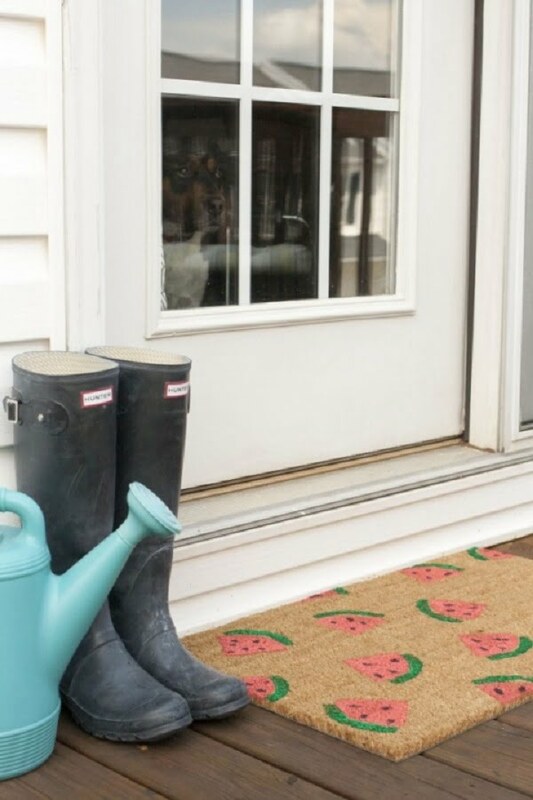 The cool watermelon shapes on this welcome mat were hand-stamped using an all-purpose sponge, and yet it pretty much looks as if the forms are integral to the carpet. For details, check the full tutorial. Looking for a rug for your kitchen? 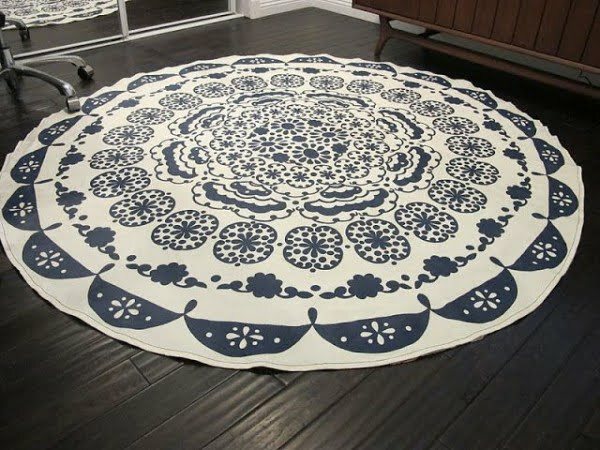 Check out our beautiful collection of 25+ stylish kitchen runner rug ideas.